Nobody likes finding mold in their home because it is an ugly sight and it is potentially dangerous. The presence of mold can result in extensive property damage as well as serious health effects for those who are exposed. Mold causes structural damage by feeding on common building materials including wood and drywall. These building materials contain cellulose which is an organic material that mold uses as a food source. As the mold eats away at these materials, they become weakened which greatly increases the risk of structural damage. Mold is also a threat to spread to new areas by dispersing its spores. While property damage is a major concern when dealing with mold, the possible health effects are a bigger cause for alarm. Exposure to the mold spores can lead to negative health effects such as allergic reactions and even asthma or lung infections in extreme cases. The longer you and your family are exposed to mold, the more likely you are to experience health effects and the worse they will become until the mold is removed. 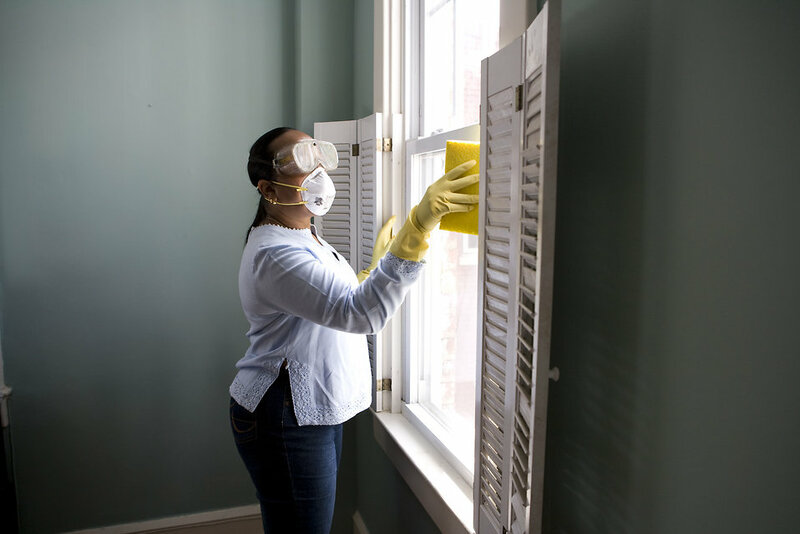 Quick mold removal will help protect your health and limit the damage to your property. You must call a professional for mold removal if the mold covers a significant area. However, if you find small amounts of mold in your home, you can take care of it yourself with household products before it becomes a major problem. It is best to react at the first sight of mold so you can prevent it from spreading and decrease the risk of property damage and negative health effects. When it comes to removing mold, the most common household remedies include bleach and vinegar. Most homeowners will think to use one of these products for cleaning mold but only one of these options is effective. This guide takes a close look at each option to help you remove small amounts of mold more effectively. Does Bleach or Vinegar Kill Mold? Bleach and vinegar can both kill mold, but vinegar is much more effective for removing mold from porous materials. This is because bleach only kills mold spores on the surface of affected materials. Vinegar will penetrate porous materials and kill the mold at the roots. If you use bleach to remove mold growth, there is a good chance that the mold will return. Always use protective gear when cleaning mold. According to conventional wisdom, bleach kills mold growth. However, this is somewhat of a myth as bleach only kills the mold on the surface without affecting the membrane underneath. You need to kill and remove this underlying membrane to effectively remove the mold growth and prevent it from returning. Bleach cleaners cannot kill this membrane because its chemical structure prevents it from penetrating porous surfaces. This causes the mold membranes to move deeper into the affected surface to hide from the bleach. You should only use bleach to remove small amounts of mold that have formed on non-porous surfaces. Another problem with using bleach is that it can actually multiply the mold growth. When bleach is introduced to mold colonies, the mold recognizes the bleach as a threat and reacts. Mold can actually use bleach as a food source once it has been exposed which will cause the mold to grow back faster and stronger. Even the EPA advises against using bleach for removing mold. Fortunately, there is another household item that can kill mold. Protect yourself from exposure to the mold by wearing protective gear such as gloves and a mask. Pour the vinegar into a spray bottle but do not dilute it. Diluting the vinegar will reduce its effectiveness. Spray the moldy areas and let the vinegar sit for an hour so that the mold can absorb it completely. If you need to scrub the mold, do so with a baking soda solution. Pour 2 cups of water and 1 teaspoon of baking soda into a spray bottle and shake well. Spray the moldy area with the baking soda mixture and use a scrubbing brush or scouring pad to scrub the mold. Wearing protective gloves will protect you from direct contact. Use clean, warm water to rinse the area. Spray the vinegar again over the area and let it dry naturally to make sure all the mold has been killed. If you notice a small amount of mold growing somewhere in your home, vinegar is the best option to remove it. The vinegar will penetrate the porous surface and remove the underlying membrane as well as the mold growth on the surface. However, you should only use this method if there is a small amount of mold in your home. Attempting to remove significant mold growth yourself is ineffective and dangerous. If the mold growth is too severe or widespread, you must call a mold remediation professional immediately. Removing small amounts of mold with vinegar is safe and effective but any substantial amount requires specialized equipment and training. Mold removal professionals will ensure all mold in your home is removed safely and effectively.